At Bluff Creek Dental, we are proud to provide high quality general dentistry, restorative dentistry, and cosmetic dentistry services to our patients in a friendly, welcoming environment. Our dentists and highly trained team of dental specialists work hard to make dental care effective and convenient. We design specialized treatment plans to suit your unique needs utilizing our wide range of services, including cosmetic tooth bonding (or dental bonding), which can fix chipped teeth and repair a damaged smile. A form of restorative dentistry, dental bonding is a convenient, safe, and cost-effective way to repair tooth chips and damage quickly and easily. Bonding uses tooth-colored biocompatible materials—generally a composite of plastic and glass—to repair chips in teeth, leaving them strong and your smile as beautiful as ever. Under the care of a skillful Chanhassen dentist, the results of dental bonding can often be indistinguishable from natural teeth, as the composite materials actually bond, or become one with the rest of the tooth. Dental bonding doesn't provide the same longevity as dental veneers, but the procedure is much less complicated and can usually be done without drilling or significantly reshaping the tooth. This makes dental bonding ideal for teenagers, who need to wait until teeth have finished developing before choosing a permanent form of restoration. Dental bonding requires no laboratory involvement, so your dentist can almost always complete the procedure in just one visit to our Chanhassen office. You can expect the whole process to take somewhere between 30 minutes to an hour. First, your dentist cleans the tooth to remove any traces of plaque or bacteria. Next, your dentist will "etch" the tooth with an acidic gel that will open up the pores in the tooth's dentin. 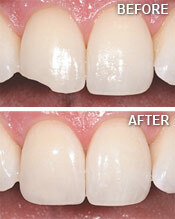 This allows the composite materials to bond to the tooth. After washing off the etching gel, your dentist will paint on the composite resin in a thin layer, then expose it to a curing light. The resin will infiltrate the open pores of the tooth and harden there, providing a strong foundation for the new structure. Once the first layer finishes curing, your dentist adds another layer, and then continues adding layers until the tooth is back to its optimal thickness. Once the last layer of resin dries, your dentist reshapes the tooth slightly to give it the perfect form, then cleans and polishes it. It's important to brush and floss your bonded teeth daily and get regular professional deep cleanings. Just like normal teeth, your bonded teeth can stain; so be sure to avoid things like smoking, red wine, cigarettes, coffee, and tea whenever possible. Also, keep in mind that composite material can't lighten, so tooth whitening treatments while wearing dental implants aren't recommended. Finally, while bonded teeth look like regular teeth, they're not as strong as natural ones, so be mindful of things like nail biting and holding utensils and pens in your mouth. 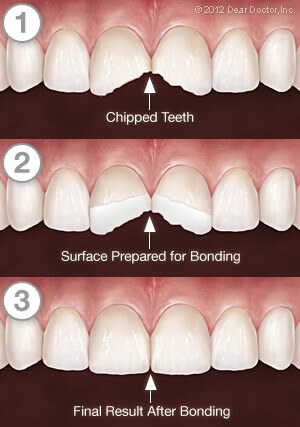 Have more questions about dental bonding? We're happy to answer them! Feel free to call our team at (952) 679-6360, reach out to us via our contact page, or use our easy online form to schedule your next appointment at our Chanhassen, MN office. We can't wait to hear from you, and we look forward to helping you achieve and maintain a healthy, beautiful new smile.